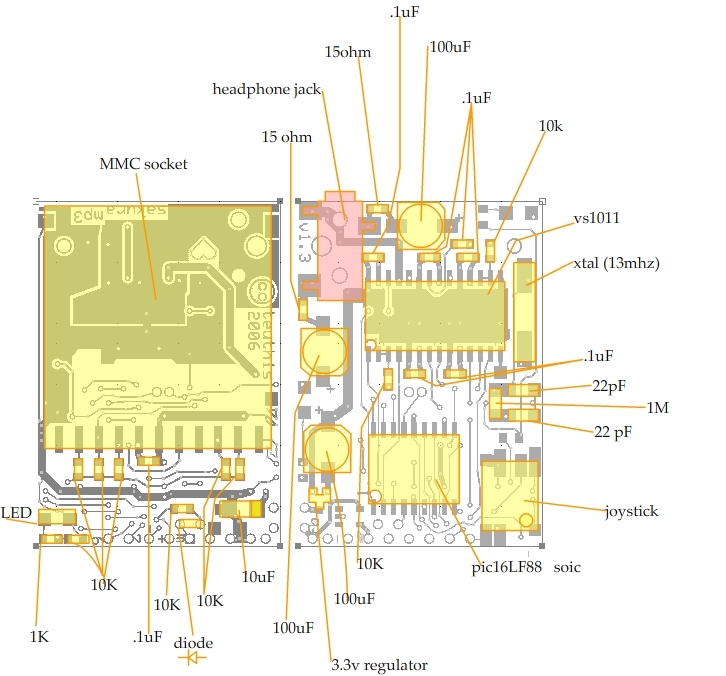 The World’s Simplest Open Source DIY MP3 player! This player features a shuffle mode, basic track navigation, volume control, FAT32 support, fragmented file support, an unlimited number of files on the root directory, and high quality playback. Files at 256Kbps can be played without a hitch. Variable bitrate files are supported with peaks up to 320Kbps. WAV files are also supported, but they have to be less than CD quality unless you put a faster oscillator in the pic. It works on my test device, but running the pic at over ~8MHz with only a 3.3 volt supply can be problematic. So I hear. I’m still working on the WAV stuff, so if you have some funny results playing WAV files, let me know. To load the memory card, you will need some sort of card reader/writer. Many computers have them built in. External USB models are available for ~$10. Make sure to format the card FAT32, not FAT16. For normal playback, load a card up with MP3 files (make sure they all have a “.mp3” file extension) and insert it into the player. Turn on the power and it should immediately start playing the first track. Tracks are played in the order that they are put onto the memory card. To get into shuffle mode, hold the “next track” button down while you power on the device. It will remain in shufle mode until the next power cycle. Once all the songs have played once (and only once) it will go to sleep until the next power cycle. BEGINNERS BEWARE! This is an intermediate level project. You will need things like a PIC programming device and some working knowlege of C programming, as well as a decent but not huge amount of electronics experience. An oscilloscope doesn’t hurt either. Be warned! And the parts are tiny! Why is it called Sakura? It’s spring here and the cherry blossoms are blooming everywhere. Sakura means cherry blossom in japanese. And the first prototype was housed in a pink plastic box. Below is the schematic diagram. Click here for a larger version in .bmp format, or go to the downloads section for the expressPCB .sch file. The source code is available in the download section. Click here. The source code is in C. The compiler I use is the PCM midrange compiler from CCS. It’s about $100 and compiles very tight code and has a reasonably full set of built in functions and datatypes. I’m very happy with it. Their website is here: ccsinfo.com. For people without any need to modify the code, there is a HEX file ready to be burned directly into a pic. Be sure to clear the BROWNOUT and WATCHDOG fuses. That means disabling them. If you don’t, the whole thing will fail to run. This is the most common mistake. Currently, all 4K of program space is nearly used up. The 256 byte EEPROM is completely used up for a lookup table for the shuffle function. There are a few non critical functions that can be removed to make some space, like the button interface and the shuffle routines. 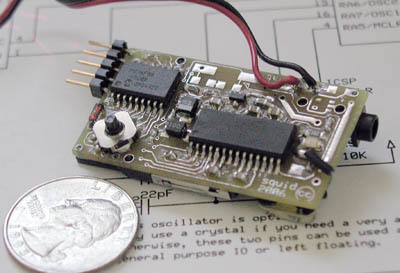 If microchip ever comes out with an 8k, 18 pin device, I will switch to that one for this project. Also, you might be able to make some of the code more efficient than I can. If so, let me know what you come up with! Go to the downloads section for the .pcb file to be used at www.expressPCB.com.